The seventh petition of the Anima Christi prayer is a cry for refuge and connects deeply to the next two petitions. All of us have moments in our lives when we need strength and encouragement to confront evil, to persevere through the challenges of discipleship, and to love selflessly. Who better to go to than Jesus, wounded for love of us? Meditating on the wounds Jesus suffered for us is a way we can take refuge in God’s love. In moments of weakness, temptation, and frailty, we have one safe place we can turn to: the heart of Jesus. Jesus opens his heart to us unconditionally, with no limits. 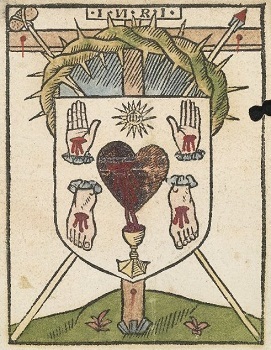 If we need proof of his love for us, we simply need to sit in front of a crucifix and meditate on the wound in his side, pierced through by a lance to his Sacred Heart. While most of us prefer to acknowledge only our strengths, the wounds of Jesus remind us that for our sake, the Son of God took on the weaknesses inherent in our human condition and embraced them fully. Saint Paul learned to rejoice in his weaknesses because they compelled him to rely on Christ rather than on himself. A young man suffered a terrible betrayal and was unable to let go of the injury or forgive. His anger at the injustice and cruel betrayal haunted him. He knew he was supposed to forgive, but couldn’t. Every time he heard a homily about forgiveness, he felt ashamed that he wasn’t strong enough to just get past what happened. After his confession, the young man was finally able to admit his inability to forgive. As he let go of his shame and prayed for the desire to forgive, he gained a sense of peace. It took time, but eventually the young man received the grace to forgive, and he has since moved forward with his life. When we don’t acknowledge our faults and weaknesses out of shame or fear, we can give into a false pride. If we hide our weaknesses form others, we can be tempted to hide them from ourselves, too, thus distorting our self-knowledge and limited our ability to grow. Blind to our weaknesses, we cannot take them into account. We can be harsh and judgmental of the faults of others because we are unaware of our own. Pushed underground, a fault becomes an invisible force that can sabotage our best efforts. How often we allow shame for our weaknesses to drive us away from Christ! We forget that the Son of God fully experienced what it means to be human, and that God knows all about our limitations and weaknesses. Those times when we feel weakest, instead of just pretending to others or ourselves that everything is fine, we can confide in our Savior. One of the greatest gifts of our faith is that Jesus is truly human and truly divine, and that he wants a relationship with us. Can we take advantage of this great gift – the desire of Jesus to be close to us – when we find ourselves struggling with our weakness? Instead of running away in shame or shattered pride, the wise spiritual choice is to turn to Jesus to share our weakness and sinfulness with him, so that he can heal, comfort, and strengthen us. When we don’t acknowledge our faults and weaknesses out of shame or fear, we can give into a false pride. If we hide our weaknesses from others, we can be tempted to hide them from ourselves, too, thus distorting our self-knowledge and limiting our ability to grow. Blind to our weaknesses, we cannot take them into account. We can be harsh and judgmental of the faults of others because we are unaware of our own. Pushed underground, a fault becomes an invisible force that can sabotage our best efforts. A visitor asked a young boy what school he attended. “Secret Heart School,” was the boy’s response. Have we unintentionally made Jesus’s heart one of the biggest “secrets” of our faith? In our daily lives, how often do we worry about being judged by God; and how often do we rejoice in God’s love for us? If we knew that the heart of Jesus, wounded for love of us, was always available for a hidden, one-on-One encounter, would we “hide” in his heart? In the Sacred Heart of Jesus, we are completely safe, accepted for who we are, embraced by his unconditional love, renewed by his delight in us. we are burdened by pain or anxiety for a loved one. We need and pray for all kinds of healing, but Jesus wants to heal us most from sin. The sins of the world have de-formed our lives and our relationships; our own sinful choices have hurt others, but most deeply, our sins have wounded us. The wounds of Jesus remind us that, like us, Christ experienced the consequences of sin. But in his resurrection, Jesus has overcome sin and death in all its forms. Because he became vulnerable for us, we can find the courage to approach Jesus and be healed. The wounds that Jesus carries on his risen body – the nail marks on his hands and feet, and his pierced side – are healing for us (see Isaiah 53:5). Jesus underwent a horrific death and rose again not just to share our experience, but also to transform all suffering and death into something life-giving. proof of his constant and saving love for us. In addition to comforting and healing us, Jesus also wants to send us into the world with the gifts of faith, hope, and love. With clearer self-knowledge, a firm intent to live God’s will, and the conviction that we are not alone but embraced in love, we return to our situation to find our circumstances transformed, full of possibility. Or perhaps we will find that it is we who have changed. The truth is that the whole world is treasured in the heart of Christ. But sometimes, only by seeking refuge in him are we able to see the possibilities in the tragic and difficult circumstances that we face.